If you’ve ever used self storage before, you know that not all storage units are created equal. Some are basic, some come with specialty features such as climate control. Now some items need the extra care, and some don’t, but when it comes to storing fine art, you definitely are going to want to look into things like climate controlled storage to make sure that the art doesn’t deteriorate because of the environment. 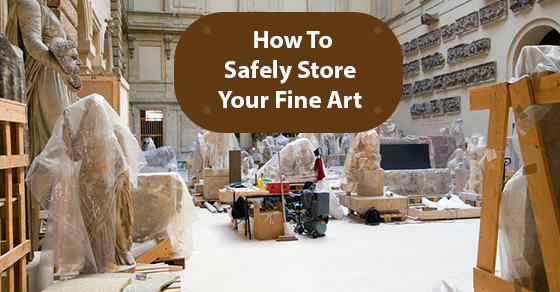 Below are some fine art storage tips to help you make sure your belongings are well protected. You are going to want to wrap the pieces up tightly with a storage blanket or bubble wrap, and then use some packing tape to seal them up. You can also pad the front and the back of the artwork using hardboard and then tape them together. Use a sheet of silicone release paper on the front of the canvas and then wrap it up using glassine paper. Like framed pieces, pad the front and the back using hardboard and wrap the entire thing up with a storage blanket and/or bubble wrap. Climate controlled storage might just be the most important consideration when storing fine art. If the humidity and temperature rapidly changes while your art is in storage, the canvas can actually stretch and loosen, which can end up causing the paint to flake and crack. High humidity conditions are also perfect environments for mold and bacteria to completely destroy your art. Storing artwork can be stressful. You don’t want your storage unit to be a target for thieves, and you don’t want to spend all your time worrying that harsh climatic changes are going to destroy art you either spent a long time working on, or spent a lot of money on, or both. Keep the above fine art storage tips in mind and rest assured that your beautiful art is stored properly while it is not in your home.